Download Slim Poster as pdf here. This poster can be downloaded in any size from 6’x2’ up to 24’x8’ or more, for free! Don't try to print this on your home printer - it is way too big and will drink all your color ink. Just send this link to your local printer and ask for a quote to have it on a banner at the size you want. Anything less than ~6 feet long makes the smallest text too hard to read, and the monster size might cost too much. The smaller size is a good ‘take home’ size and the very smallest text is still just readable. The larger size takes up a big wall and needs nails or grommets. If it is exactly the width or half the width of the printer's vinyl print rolls then you get the best value per dollar per inch. Standard rolls & printers in the USA have a 54inch roll width, so printing the image size four feet & one inch tall (or two aligned together at ~25inches wide each) is the best strategy. You can make the size match a wall space where you would like to hang the poster long-term. Printing on vinyl gives super sharp text, is waterproof and durable. If your printer doesn't like the JPEG file but would prefer the Indesign files, then use the 'Edit for Other Languages' link below. Using the English version of the poster works pretty well in any language because (a) people can’t read the text on it while in a group sitting more than a few feet away, (b) the pictures and the matrix format are what people can see and do benefit from, and (c) people in most cultures remember pictures and stories better than text. 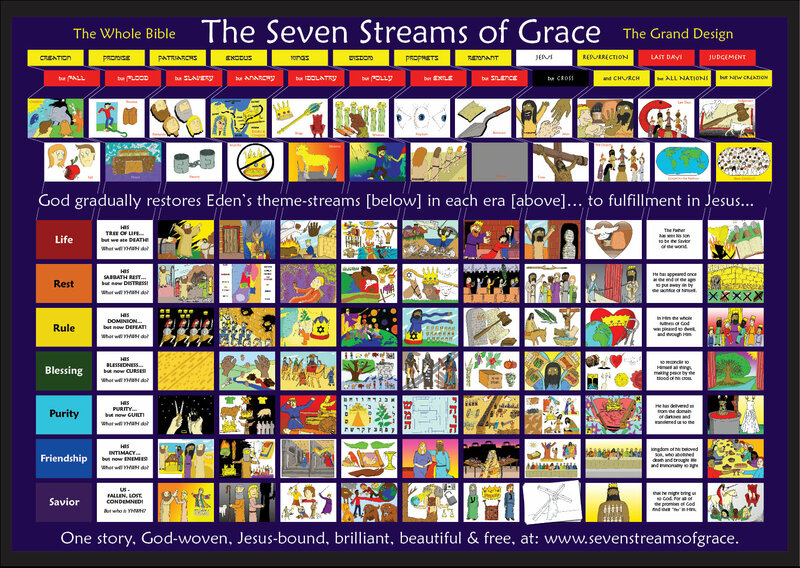 You can make or get a translated poster – see www.sevenstreamsofgrace.com/languages. If you want to print each artwork on A4 or letter paper to present to groups and lay out on the floor or tape on a wall one at a time - 24 lengths of A4 is ~20feet long! This is a set of 'Indesign' files for your clever graphics person to access and use. You might want to re-draw some faces and colors to match your culture (Asian, African, Arabic, whatever), or even create new artworks, and you might want to replace the text with Khmer, Swahili, Spanish or whatever. Since I am allowing you to access and use these files for free, please don't sell them/ the posters for profit but put any earnings back into the SSoG. Please also send us a link so that we can put the posters up on the website here.